The AIST-MeRAM logo was created with the inspiration from Chinese philosophy, Yin and Yang. It represents the balance between use of chemical substances and maintenance of ecosystems. The S-shaped line drawn through the middle represents a river or dose-response curve for risks. The followings are information regarding the naming of the tool and concepts behind the logo. 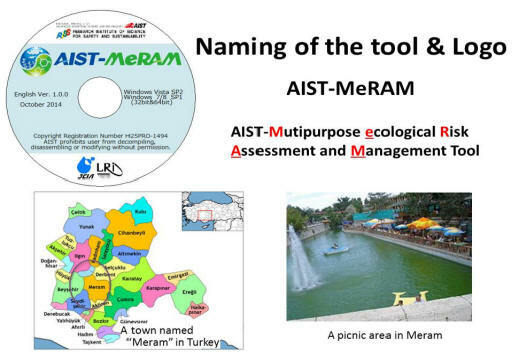 The logo was designed to straightforwardly reflect the purpose of AIST-MeRAM, which is ecological risk assessment. Ecosystem is represented by the image of swimming Medakas (Oryzias latipes), whereas a chemical substance is represented by the image of benzene circles side by side. The whole design is based on the motif of the Tai-Chi symbol expressing the Yin and Yang philosophy. Chemical substances have become essential to our life, and it is for this reason that we need to maintain the balance between development of our living environment and ecosystem conservation by performing quantitative assessment of chemical effects on ecosystems. In order to meet this social needs, we have developed AIST-MeRAM.